An actor in one of the biggest comedies on US television, Two and a Half Men, has described the show as “filth”, while urging viewers not to watch it. 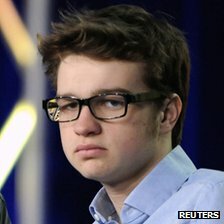 In a video posted online by a Christian group, Angus T Jones said he no longer wanted to take part. The 19-year-old explained that the show’s raunchy humour conflicted with his recent bible studies. Jones, who has been in the show since he was 10, said viewers should question the impact such programmes had on them. The clip was posted by the Forerunner Christian Church in California, where Jones, who reportedly makes $350,000 (£218,000) an episode, says he sought spiritual guidance. Warner Bros Television, which produces the show, and CBS, which airs it, have made no comment. In Two and a Half Men, which has run for nine seasons, Jones is the underachieving son of an uptight father, played by Jon Cryer. The series originally starred Charlie Sheen as the womanising uncle of Jones’s character. But Sheen was fired in March last year after a bizarre rant against the show’s lead writer, and Ashton Kutcher replaced him.